Get bold and comfortable style with the UGG® Cali Sneaker Low Perf. Perf leather upper in a casual silhouette. Smooth and breathable leather linings. Fully cushioned, leather-lined footbed for added comfort. Durable rubber outsole. Imported. UGG® Men's Size Chart Measurements: Weight: 12 oz Product measurements were taken using size 11, width D - Medium. Please note that measurements may vary by size. Weight of footwear is based on a single item, not a pair. Are you looking for a pair of comfy and affordable kicks? 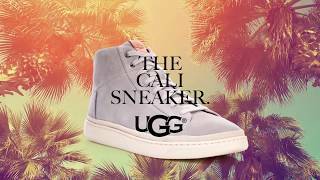 Then look no further than UGG Cali Low Sneaker! These sleek, stylish and hardwearing sneakers are your best bet to experience the trademark traits of this trusty brand. This edition of UGG’s is a subtle throwback to the skating scene in the 1970s. From the clean lines, cushioned soles to the soft hues― each detail on this sneaker aligns with the laidback style of sunny-side California. 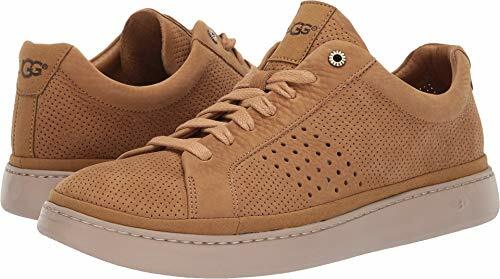 Like other shoes manufactured by the brand, UGG Cali Sneaker Low’s biggest selling point is the comfort level. This statement is backed with features like the efficient EnerG Comfort System, open-cell PU foam and lightweight construction. The insole comes with built-in arch support that enhances the shoes’ flexibility. Then there is UGG’s iconic Treadlite outsole which is known to create a nice cushioning effect for your feet. Moreover, the benefits of the extra layer of open-cell PU foam are multifold. For starters, the material allows air to pass inside the shoes making the shoes breathable. Then, the antimicrobial and moisture retention system make these sneakers sweat-proof and skin-friendly. All these features make them easy-to-wear for long durations without any discomfort. What’s more? The designers have used high-quality suede leather for the upper’s construction. This makes the shoes feel softer and smoother than other sneakers available in the market. The design might be simple but they’re available in various colorways like a nice dusty beige and rusty maroon. Both colors are easy to pair off with any ensemble. This casual style makes them the best shoes for everyday use. In the end, the comfort, breathable design and easy minimalist construction make these kicks a crowd pleaser. The best part is that they are pretty light on your budget too. All these qualities make them a solid addition to your shoe collection.